In addition to a new year, this season heralds the return of that delicious little citrus, Key lime. While the peak season for Key limes is June through August, they’re in stores now. There are two principal lime types in American supermarkets: the Persian or Tahitian lime, which is what Americans think of as “lime” (see the many different types of limes), and the Key lime, which originated in southern Asia. After centuries of travel to different lands, it ended up in the Caribbean, including the Florida Keys, for which it is named. The Key lime has a higher acidity, a stronger aroma, and a thinner rind than the Persian lime, and is tart rather than sour. That makes it just right for desserts. If you’ve only had Key lime pie made with bottled lime juice…well, you know the superior, sparkling flavor of fresh lime juice. Pick up some Key limes and make a Key lime pie from scratch. If you have an ice cream machine, make some key lime sorbet as well. You can use Key lime juice in any recipe that calls for conventional lime juice. Try it with olive oil on a salad, substituting for vinegar. Squeeze it in a cocktail. Enjoy Key lime season for as long as you can. Key lime pot de crème recipe—same delicious filling without the crust. The history of Key limes and Key lime pie. 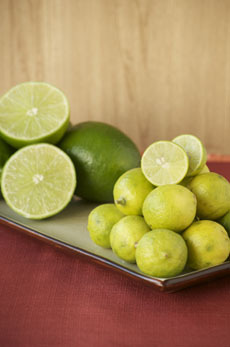 Lime Glossary: the different types of limes. rounder Key limes. The color can range from dark green to yellowish. Photo by Evan Dempsey | THE NIBBLE.